In retrospect, Christine Denise Washington said she should have realized something was wrong with the Harts. She bonded with Jennifer Hart, known as Jen, and her six adopted children. Sarah Hart, Jen’s wife, and the one who worked outside the home, wasn’t there. Washington, now living in Arkansas, is one of many people trying to make sense of the tragedy that befell the Harts last month when an SUV carrying the mothers and at least three of the children plunged from a 150-foot cliff in Northern California onto the oceanside rocks below. Sarah and Jen, both 38, died, as well as Markis, 19, Abigail, 14, and Jeremiah, 14. Authorities believe Devonte, 15, Hannah, 16, and Sierra, 12, may have been in the vehicle and were swept out to sea. Beachgoers on Saturday found the body of an African-American girl of undetermined age floating in the surf along the Mendocino Coast near where the Hart’s vehicle went off the cliff. Authorities said it could take several weeks to determine if the body is one of the missing Hart children. Officials have said the crash may have been intentional, judging by software in the vehicle showing it stopped at a pull-off area before speeding off the cliff. Officials found no skid marks to indicate sudden acceleration or braking, according to a search-warrant affidavit. They left a trail of child-abuse allegations across three states, including one that prompted an official from Washington’s Child Protective Services to visit their Woodland house right before they drove off for California. Who were the Harts, really? But some clues can be pieced together: a South Dakota childhood for both women, a romance likely kindled in college, a series of adoptions and allegations of abuse, including beating and food deprivation. All the while, they immersed their children in an alternative culture that emphasized love, unity and music, while keeping their distance from neighbors and the outside world. It was at the Shangri-La festival near Minneapolis that Ribner said he met the Harts six or seven years ago. They were living in Minnesota then. Ribner, who plays trumpet, belongs to a band that played there, called Nahko and Medicine for the People. Led by Nahko Bear, a Portland-born singer and guitarist with a spiritual bent, the multiracial band was a favorite of the Harts, Ribner said. Just how much the Harts were Nahko devotees can be seen in videos on Jen’s YouTube channel. In a 2012 video, titled “Thanksgiving Blessings,” four of the children perform one of his band’s songs. “We are so provided for,” they repeat, as one of the children strums a guitar with “Nahko” written on it in large letters. “We are grateful for you,” a sister says, blowing a kiss. The musician was not available for comment, said his tour manager, Melissa Gibson. After high school, Sarah went for a semester to the University of Minnesota-Twin Cities, and then transferred to Northern State University in Aberdeen, South Dakota, according to records from both schools. She majored in elementary education — and so, during the same period, did Jen Hart, who hailed from Huron, South Dakota, a prairie town of about 13,000. They left school in 2002 and were settled by 2004 in Alexandria, Minnesota. If they didn’t stand out at first, they definitely did by November 2010, when then-Detective Sgt. Larry Dailey interviewed the couple. “Two women raising six black kids,” said the now-retired detective. You didn’t see that too often in the predominantly white town of Alexandria, which is surrounded on almost all sides by lakes. The women had adopted two sets of siblings — the first (Markis, Abigail and Hannah) in 2006 and the second (Devonte, Jeremiah and Sierra) in 2009. All the siblings were placed with the couple by the Texas Department of Family and Protective Services, agency spokeswoman Tiffani Butler confirmed. Out-of-state placements are not uncommon, according to Butler, who said privacy rules kept her from saying whether the children were fostered by the Harts before being adopted. The Harts (Sarah took Jen’s last name in 2005) complained to Dailey about getting funny looks from neighbors and fellow churchgoers. Their kids, they told the detective, were picked on at school. The women said they wanted to move out of Alexandria. As Dailey said he saw it, the Harts’ feelings of being out of place had nothing to do with his investigation. Abigail Hart, then 6, had told a teacher that she had “owies” on her tummy and her back after “Mom hit me,” according to court and police records. The teacher lifted the girl’s shirt and saw bruising from her chest to just above her belly button, and along her back. The girl later told Dailey and a county social worker that Jen had gotten mad after a penny had fallen out of the girl’s pocket onto the floor. Abigail said Jen took her to the bathroom, put the girl’s head in cold water and hit her with a fist, according to a police report. Abigail also said she was routinely punished by being grounded, which meant staying in bed and skipping lunch. The other kids got grounded, too, and spanked, Dailey wrote in his report. It was not the first accusation of abuse. In 2008, another Hart child, then 6, told police and a social worker that Jen had struck the child’s arm with a belt, leaving a bruise. Questioned, Jen and Sarah said the child had fallen down stairs in their house a few days before. The women also told the officials the child was adopted and having “food issues,” stealing food at school or eating out of garbage cans or off the floor, according to the investigating officer’s report. Persuaded, the police closed the case. Not so Dailey’s case. The women had a different version of events from Abigail. Sarah and Jen told police it was Sarah who hit the girl. Upset over Abigail’s lying, Sarah said, she bent the girl over the tub and swatted her backside. She had lost her temper and gotten carried away, Sarah said. Jen stayed at home with the kids, and her dominant role in the children’s lives might account for why Abigail blamed her, suggested Sarah, then a department-store manager in the town’s Viking Plaza Mall. In April 2011, Sarah pleaded guilty to a misdemeanor charge of domestic assault. She received a 90-day suspended sentence and a $300 fine. The women soon withdrew all their kids from the school district and started home-schooling them. Then, the Harts made good on the promise to move. ‘Free Hugs’ Sarah came to the Portland area first, looking for work, Ribner said. He would see her at concerts. Why Portland? “That’s a really good question,” Ribner said. He said he assumed it was because the area was more accepting of LGBTQ families, and difference in general. There are a lot of pictures of the Harts in front of “Keep Portland Weird” signs, he said. Sarah found work at Kohl’s department store and Jen and the kids soon joined her. The family dived into the local scene, according to Ribner. They went to concerts, Earth Day events and political rallies. 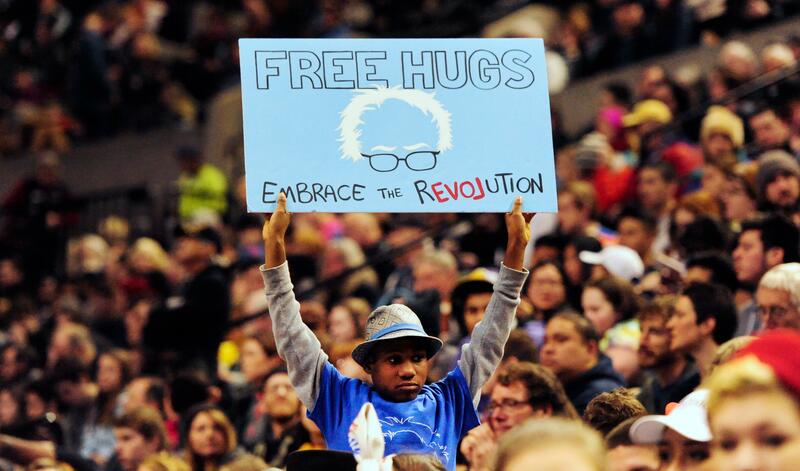 At a 2014 protest over police brutality, 12-year-old Devonte, wearing a “Free Hugs” sign, was famously photographed hugging a police officer, tears streaming down the boy’s cheeks. Neighbors got to know the kids even less. The Harts never enrolled their children in local school districts, nor did the family turn in required forms to home-school in Oregon or Washington, according to officials. The Harts first settled in West Linn, Oregon, a former mill town now serving as a 26,000-resident bedroom community that’s one part wealthy suburb and one part bucolic hillscape. The Harts raised chickens and goats and grew vegetables, said neighbor Bill Groener. Sarah was “the spokesperson,” Groener said — “friendly, but guarded.” He rarely saw Jen. Rarely did conversations extend beyond a few words at the mailbox. Sarah did share one ambition with him. One day, Groener walked onto his porch and saw a Hart boy crawling inside his old Buick. He watched as the boy — who he later thought was Devonte — scampered next door. Later, Groener went to talk to his parents. On July 19, 2013, the West Linn police visited the Harts’ home with Oregon Department of Human Services officials, said interim Police Chief Neil Hennelly, citing a police report. Details are not publicly available because Oregon law restricts information about child-welfare visits. That visit might have resulted from a woman’s report to Oregon officials that year. Alexandra Argyropoulos, a former friend of the Harts, told the Associated Press in a statement that she “witnessed what I felt to be controlling emotional abuse and cruel punishment” toward the children. She said the Harts withheld food as punishment. She did not return calls from The Seattle Times seeking comment. Groener did not remember seeing police visit, nor did he suspect mistreatment. For all the time they spent inside, he also saw the family pack for camping. They mentioned that the kids were not allowed sugar. The couple brought home vegetables from a farm. In fact, they were regulars at a food pantry and farm about 40 minutes south of Portland in Sherwood, Oregon, where they could pick up organic produce and save money. “They were really focused on paying off debt to buy a home,” said Tyler Boggs, president of the Good Neighbor Family Pantry, which provides imperfect fruits and vegetables from supermarkets at no cost. Soon, the Harts began to volunteer at the farm, said Boggs’ wife, Elizabeth Boggs, who operates Heart 2 Heart farms. The kids would help for a while, then play with the Boggses’ animals or read in the sun. “Devonte was probably the most outspoken and social. Sierra and Hannah and Abigail were quiet. They would read a lot when they were here. They all loved the animals,” Tyler said. The children talked with passion about social justice and the outdoors. Tyler spent time with the children at the farm — away from their parents — feeding goats or cows. He said he never saw indications that the children were being abused or deprived of food. If they were, they “had opportunities in abundance to reach out,” Tyler said. Last year, Sarah approached real-estate broker Joe Carbajal warily, interviewing him for about an hour and a half, looking for the right fit. “They were cautious,” he said. Sarah didn’t get specific, but alluded to perceived prejudice against her family in Minnesota. In Portland, she told him, the family had received too much media attention after Devonte was pictured hugging the police officer in the viral photo. “They needed a fresh start,” Carbajal said. The Harts began searching as a family, often traveling to showings as a group of eight. The children always brought books to read, Carbajal said. Sometimes, they brought a family dog, taking turns walking it or giving it water. “They were pretty giggly and happy all the time,” Carbajal said. On one property tour, the children found a frog and a snail in a marshy area, Carbajal said. Jen and Sarah talked them through identifying the creatures. “They were all working on figuring out what [species] it was without a book or reference,” Carbajal said. The Harts settled on a house on 2.2 acres of pastureland in Woodland, Washington. From a nearby hill on a clear day, they could see Mount St. Helens, Mount Adams and Mount Hood. There were houses within a couple of hundred yards on either side — but it was quiet, with plenty of space for crops and a barn in the back. Neighbor Jon McHugh said his interactions with the family were few but “pleasant.” He occasionally saw the children outside. He showed them his rabbits and chickens. At least once, one of the girls offered his 5-year-old a freezer pop. He rarely saw Jen, who stayed inside. A few times, he talked with Sarah and the children, mostly about their respective animals or backyard projects. Their other neighbors, Bruce and Dana DeKalb, had a different experience. They said they didn’t realize Jen and Sarah even had children until August, months after they moved in, when a small girl rang their doorbell at 1:30 a.m.
As soon as Bruce DeKalb opened the door, the girl — who they thought looked about 7 years old — came inside and ran into their bedroom. “She was pleading with us, ‘Don’t make me go back. They’re mean, they’re abusing us,’ ” he said. The couple did not see any obvious signs of abuse. Then, the couple saw the rest of the Hart family walking on their property with flashlights and calling for Hannah. Bruce yelled to the Harts through the open door that Hannah was in their home. “They just barged in,” Dana said. “They started searching the house — my house,” before finding Hannah crouched between the bed and the dresser. Jen told the DeKalbs she needed a moment with Hannah. The next morning Hannah, accompanied by the rest of the family, brought over an apology note. Jen told the DeKalbs that Hannah was a “drug baby” and she had a bipolar mother, Dana said. They told the DeKalbs that Hannah was 12 — about four years younger than her true age — and said they had pulled the children from school after bullying. Both retired and often home, the DeKalbs said they rarely saw the children outside. Beginning on March 15, Devonte began to come over each day asking for food. At first he asked for tortillas, which they gave to him along with some energy bars. He began to ask for more as the days carried on, they said. He wanted six packages of tortillas and peanut butter, along with cured meats. Gradually, Devonte began to open up about his home life, Dana said. He told them his moms were withholding food as punishment, sometimes for days at a time. Hannah had been truthful with the DeKalbs in August about abuse, he told them. He implored the DeKalbs not to talk to his moms or call the police because he feared the siblings would be separated. The DeKalbs wondered if they were being manipulated by a teenager, or if there was, indeed, abuse, Dana said. A few days later, Devonte asked Dana to leave food in a box at the fence line separating the families’ properties. The DeKalbs thought he could no longer risk coming over. On Friday, March 23, Dana DeKalb called Child Protective Services at about 10 a.m. An agency official visited the Hart home later that day, arriving just minutes after Jen had pulled into the family’s driveway in the SUV, Dana said. The door apparently went unanswered. After a few minutes, the CPS official left, Dana said. About half an hour later, Dana saw Sarah’s car scream up their gravel driveway. The next morning, a cinder-block wall near their garage had been knocked over. The Harts’ SUV was gone. Published: April 8, 2018, 1:01 p.m.